?Precision Timekeeper? August Ericsson, St. Petersburg, No. 1199, movement No. 9865. Made circa 1900. Very fine and rare, keyless, silver deck and pocket chronometer with spring detent escapement and Guillaume balance. C. Four-body, "bassine?, polished with gold hinges. Hinged silver cuvette. D. White enamel with bold radial Roman numerals, outer minute track, subsidiary seconds dial. Blued steel "spade" hands. 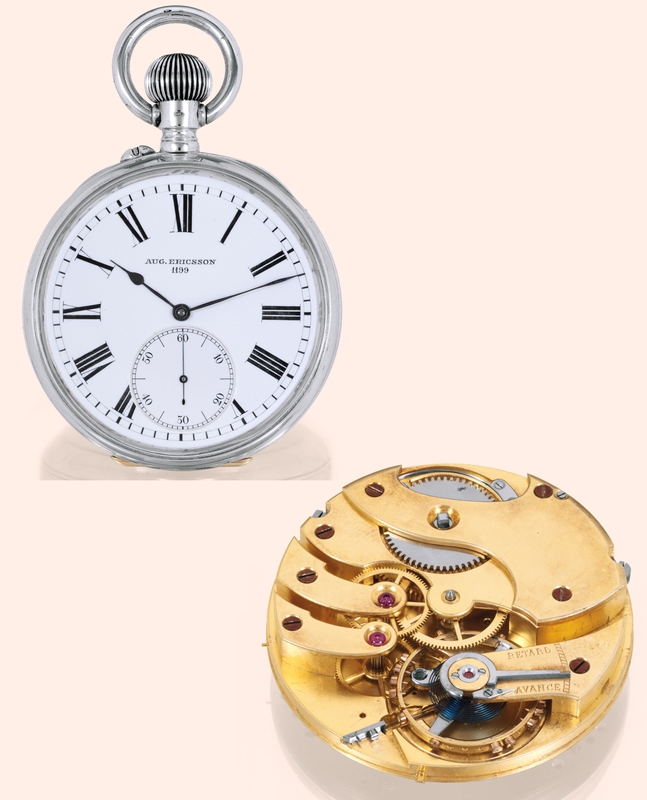 M. 48 mm (22'''), frosted gilt, 15 jewels, Earnshaw- type spring detent escapement, anibal-brass Guillaume compensation balance with gold temperature adjustment screws, blued steel Breguet balance spring, index regulator. Dial and case signed, movement numbered on the pillar plate. Diam. 58 mm. C. Four-body, "bassine, polished with gold hinges. Hinged silver cuvette. D. White enamel with bold radial Roman numerals, outer minute track, subsidiary seconds dial. Blued steel "spade" hands. Two other watches of this type have been sold by Antiquorum. In the sale of Important Watches on September 28, 2005, lot 171, and at Antiquorum, Geneva, on November 11, 2001, lot 133. Born in Sweden, he established an impressive business in St. Petersburg, Russia, around 1875. Most of the marine chronometers supplied to the Imperial Navy were made by him; they generally used Kullberg movements. One of his brothers, Bror, founded the Stockholm Watchmakers? Association in 1884, and one of his sons, Alexander, became a chronometer maker.